aka Cedrus deodara Feelin' Sunny® which is the commercial name given by the originator. Cedrus deodara 'Monkinn' when young, is a flat, spreading, golden selection of Himalayan cedar. Needles sheltered by the plant's outer growth will present the typical gray-green color of the species while any foliage exposed to sunlight will be a pleasant golden yellow in color. Branching is flat and arching. As plants mature, they will develop apical dominance and become an upright, tree form, typical of this species. Annual growth is around 4 to 6 inches (10 - 15 cm) a year, mostly outward at first. After 10 years a specimen will eventually reach a mature size of 10 feet (3 m) tall and 6 feet (2 m) wide. 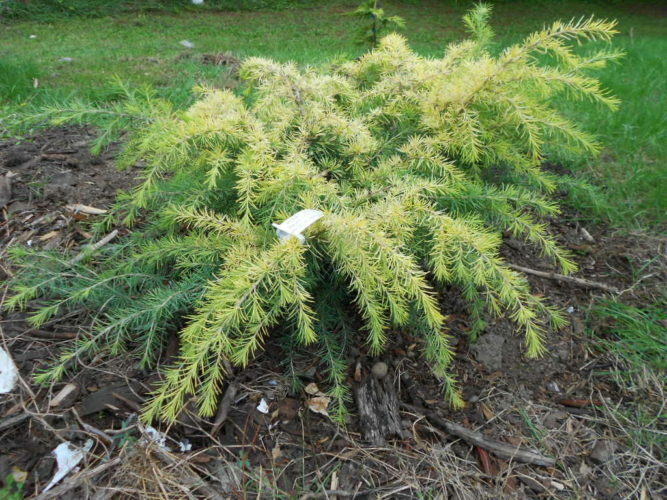 When first introduced to the nursery trade, Monrovia Nursery of Dayton, Oregon claimed that this exciting new cultivar of Himalayan cedar was found in 2004 a spontaneous whole-plant mutation within a nursery block of Cedrus deodara 'Feelin' Blue.' As plants began to mature, it became evident that this is probably not the case. In all likelihood, a random seedling made its way into that particular block of plants. To create a dramatic effect, try planting Feelin Sunny® on a bank interspersed with Blue conifers of similar growth habit. In 2012, Monrovia nursery was granted Plant Patent #23,886 for this cultivar. Cedrus deodara 'Feelin Sunny' a new plant for 2013 featured at Glacier's End Arboretum in Olympia, WA. 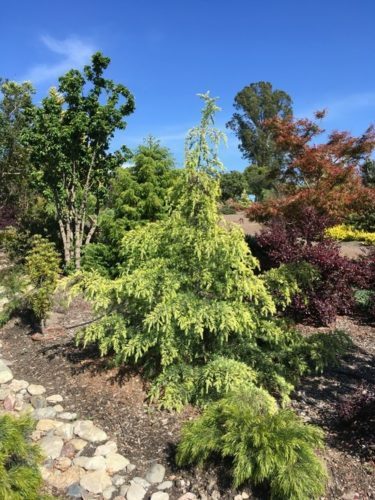 Cedrus deodara 'Monkinn' Feelin' Sunny® in a private garden in Petaluma, California.